As with any passionate interest, there are those of us who fetishize absinthe and obsess over every detail to the point of distraction. It’s amusing to me how oblivious we homo sapiens can be about this shared tendency of ours. When I see a sports fan shake his head in disgust or derision at comic book geeks and their bagged-and boarded collections, then chug a beer and go into a ‘roid rage because his fantasy football team didn’t win, I can’t help but smirk at his ridiculous hobby and then go home to reorganize my antique absinthe spoons. Oh, the humanity. I’m not sure if there is a rating system for ‘roid rages (I like to think the baseline is “Over the Top! !” and then goes up from there into a Mortal Kombat-styled hierarchy of “Fatalities”), but there are for comic books (both content and condition), and there certainly are for absinthes as well. 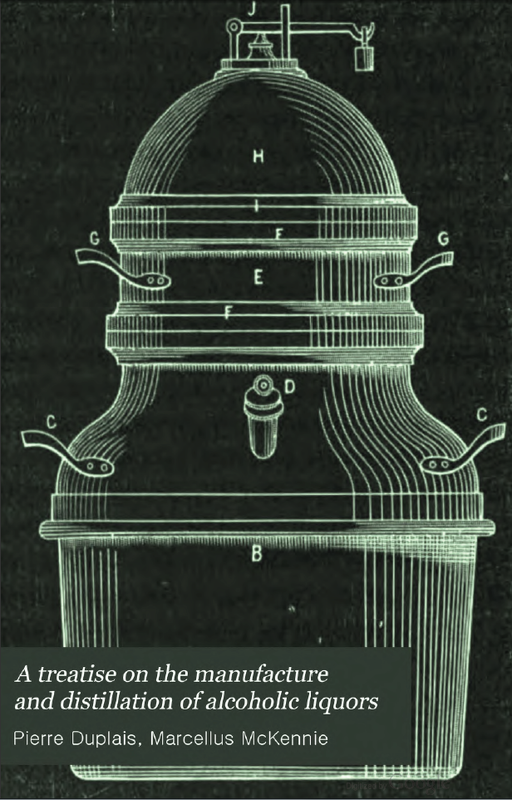 The idea of a numerical scoring or rating system for absinthe is a fairly new one, considering that genuine absinthe was largely unavailable for close to a century (and doesn’t seem to have been rated that way in the 19th or early 20th century), but since its return to the stage there have been at least two systems developed for the drink. The first appeared on the La Fee Verte forum in 2005 and is a 100-point system which provides for a quite detailed review of each drink, but as a result may be intimidating to newcomers and somewhat cumbersome to use. Another rating system appeared on the Wormwood Society forum a couple of years later, and is a simpler 5-point scale which was based on the U.C. Davis 20-point scoring guide for wine. It has fewer categories than the Feeverte system (“Louche Action” and “Color After Water” are both dropped) and is weighted to give more heft to certain categories. Each one of these is fine, but both reflect a good bit of that fetishistic behavior that we enthusiasts can exhibit from time to time. While the idea of a rating system is to be able to both appreciate and enjoy our drink more, as well as provide a means of comparison for someone who may be looking to purchase a new absinthe, it takes some of the fun out of my sipping pleasure to go too far and overthink the matter. So I’ve created my own simple rating system for folks who would like to provide a numerical score without having to spend a whole lot of time doing math. That’s it. Two categories, each worth 5 points for a combined total of 10 points. (You can add a zero to the end of your final score if you want to convert it to a 100-point scale). And here you thought you’d have to print this out on graph paper and break out your old scientific calculator. The general idea is that you pour your absinthe into a glass, taking note of the color and clarity, then add water while observing both the loucheing action and final louche, as well as breathing in the fragrance as it wafts up from the glass; afterward, write down a number between 1 and 5 which represents how you would rate the experience overall. Some simple concepts to keep in mind are that absinthe should smell like a crisp, alpine meadow (as a result of grand wormwood, which it must contain) with the scent of other herbs (chiefly green anise) being detectable, but it shouldn’t smell grassy or spinachy. The liquor should be clear if it is a blanche, and a natural peridot green if it is a verte, and should not have organic material or sediment of any sort floating in it. After that, sip the finished drink and evaluate the taste, mouth-feel, and finish, then write down a number between 1 and 5 evaluating these aspects, with 1 being the lowest rating for a terrible-tasting beverage which you want to scrape off of your tongue, and 5 representing a drink on par with the nectar of the gods that you’d punch a puppy in the face to get another bottle of. Keep in mind that it should have a notable but pleasant bitterness at it’s core, with flavorful herbs shaping the overall taste, and a slight numbing and cooling of the tongue. When you’re done, add the two numbers together, and you’ve got yourself an absinthe rating score that you can take to the bank (good thing too, considering the price of absinthe). Effective and elegant. There are probably some veins throbbing in foreheads out there (in between the dismissive shrugging and the haughty eye-rolling), but the fact is, the more complicated a scoring system becomes, the less reliable and accurate it seems to be. Of the two existing score charts, the Wormwood Society system is closer to my ideal, but I disagree with the weighted percentage they have allotted to certain categories (such as having Flavor counting only a little more than, say, Louche). In fact, their two categories of Appearance and Louche are cumulatively worth more (32%) than the two combined categories of Flavor, Mouthfeel and Finish (30%); as much as I enjoy good presentation, how pretty something looks is never going to count for more to me than how it actually tastes. 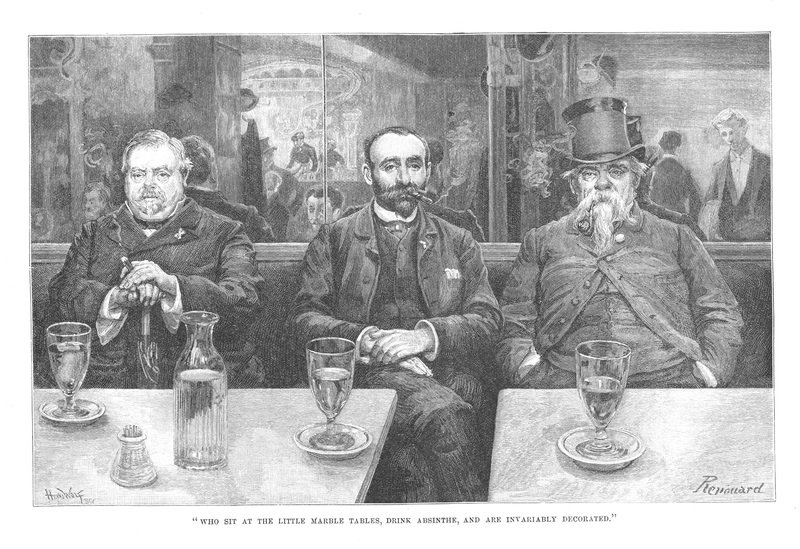 Based on the no-nonsense stare of the absinthe professors below (taken from the April 1889 issue of Harper’s New Monthly Magazine), I don’t think I’m alone in that line of thinking. With my system, I’ve basically accounted for the three attributes of color/clarity, aroma, and the louche for the first half of the score, while giving more weight to both flavor and finish to account for the second half of the score. Of course, you could write down some specific notes, observations, thoughts and inspirations obtained during the entire process (and I would encourage you to do so), but by definition those are not part of the score; the number you arrive at as a result of evaluating those observations forms the score, while the actual observations form the basis of a review. That may seem obvious, but I find it helpful to make a clear delineation of the two concepts. Not everyone needs or wants a five-paragraph essay on exactly why a particular bottle scored a 2 out of 10 — the fact that it scored only a 2 is sometimes as much as they need to know in order to avoid it, and then if they want to know more, they can read a review. Whichever way you choose to drink and/or evaluate your absinthe, make sure that you don’t work so hard at coming up with a number or an opinion that you fail to take the time to savor and enjoy it! Lump it or leave it? To sweeten, or not to sweeten: that is the question when it comes to preparing a glass of absinthe. Absinthe is distinctive in the world of alcohols for a variety of reasons, but one of the most interesting to me is that, while it is technically a liquor (and not a liqueur, which by definition is pre-sweetened in the bottle), it has been overwhelmingly popular to prepare it with sugar. Consider the additional distinction that absinthe as bottled is basically a concentrate, and you have yourself a most unusual alcohol, indeed. From the tidbits of information I’ve been able to glean regarding distilled absinthe’s transformation from medicinal tonic in the 1700s to mealtime aperitif in the 1800s, it appears that the very earliest versions of absinthe liquor were not intended to have sugar added at all. This makes sense to me given the medicinal origins of absinthe, and also if I consider distillers to share some commonality with chefs, in that they have worked hard to formulate a balanced creation intended for consumption as is, and if you reach for the salt and pepper (or, in the case of absinthe, sugar), there’s an implication of imbalance. For an exacting artist and professional, this is practically akin to a slap across the face and a fart in their general direction. However, the fact that absinthe is bottled as a concentrate which is meant to have a significant amount of water added to it, but that the ratio of water-to-absinthe was approximate, indicates that there had to be some leeway allowed for individual taste for preparation. In addition to this, folks in the 19th century are said to have had quite a sweet tooth compared to modern-day drinkers (something which is difficult to believe, considering today’s preponderance of things like high-fructose fake grenadines without real pomegranite, and the terribly sweet sweet-and-sour mixers found in stores and out of the gun at any given bar or club, but that’s an argument for another time). 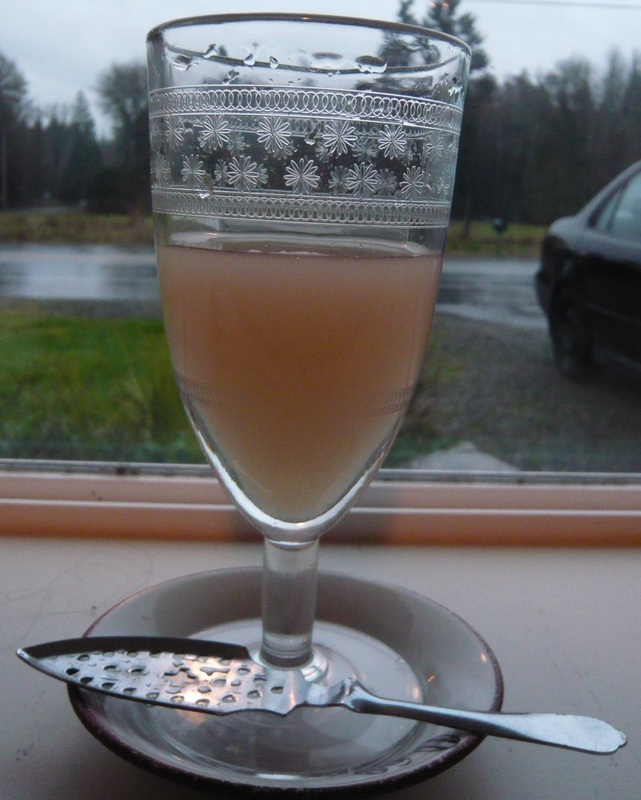 Given that absinthe was barely one step removed from still being considered a medicine that folks simply grit their teeth together and choked down because it was good for aiding digestion, it makes sense that there would be a no real objections to allowing folks to add their own measure of water and sweetener to temper the wormwood’s natural bitterness. Interestingly, some photographs and illustrations from the period show no sugar being used at all, while some show two or even three sizable cubes of sugar being used per drink, although it has been surmised that the cane sugar used for cubes produced in that time were not quite as sweet as present-day sugar cubes. The chronological order in which the Belle Epoque absinthe ritual as we know it today arrived at its ultimate destination is a little murky. It’s generally accepted that absinthe first gained popularity with French legionairres in Algiers (the capital of French Algeria) and other colonies beginning in the 1830s, for whom it was “prescribed” as a salutary method of purifying local water. By the time the North African campaigns ended and the soldiers returned to France, they had developed a taste for the beverage and brought it with them to the local cafes which were just then beginning to become so popular in Europe. For another decade or two, drinking absinthe was largely restricted to the military and the upper classes because it was relatively expensive compared to beer and wine, but it would soon become more affordable as production costs went down. 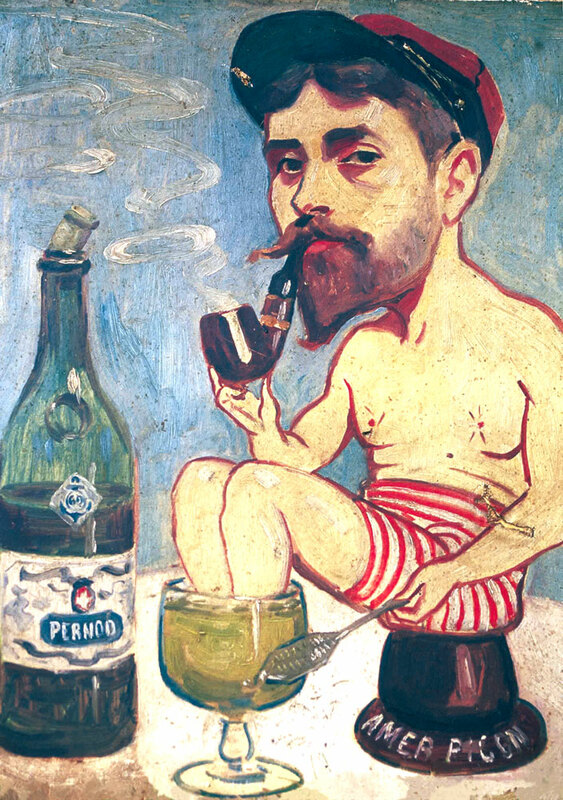 It also skyrocketed in popularity as artists and bohemians consumed it with abandon and began to sing (and paint, and write) its praises; ultimately, it became the pre-dinner drink of choice throughout all of France, and a special perforated absinthe spoon was developed to make the addition of sugar even easier for those who wished to. Even women were getting in on the act, which was a relatively ground-breaking notion in that day given that hard liquor was considered to be for the menfolk. While it’s a matter of personal preference on how much sugar to add, if at all (hey, I tend to like a teaspoon of agave for many brands of absinthe), see below for one young lady’s lesson on how to prepare a sweetened absinthe and party like it’s 1899. One of the things which I admire most about the storied history of absinthe is precisely that – the story and the history. While the absinthe-fueled accounts of various playwrights, poets, murderers and thieves are intriguing, they don’t compare to living your life and making your own stories and memories. For me, absinthe has played a central role in several memorable moments, more so than any other drink. Red wine comes in a close second, but it usually plays a supporting role and I very rarely remember the specific wine for a particular occasion. Which is why, even though it was not a surprise to me, I was saddened to hear the official word that Trillium Absinthe would no longer be produced. In the interest of full disclosure, I should say up front that Trillium is not a very good absinthe. Mind you, it isn’t bad; the distiller at least had the decency to use actual grande wormwood and to not use unnatural colors (something which, shamefully, the modern Pernod absinthe cannot say). However, the color was a bit too straw-like and pale, indicating a poorly done coloration process, and the wormwood itself did not taste like top-grade wormwood which I’ve detected in the very best brands. Having said that, Trillium was distilled by Integrity Spirits in Portland, Oregon, as close to a hometown in my adult years as I’ll likely ever know. It’s my understanding that Trillium was actually the second American-made absinthe to be released after the lifting of the “ban” in the United States (perhaps we’ll discuss at a later date how, technically speaking, there appears to have never been an actual ban on absinthe here), the first being St. George. As it was such an early absinthe leading the charge into the 21st century, I had hoped that Trillium would fulfill its potential and fine-tune its recipe into something very tasty indeed. As superficial as it may seem, I love the name and Trillium flower, and they had an attractive sky blue and white color scheme for the bottle. Unfortunately, it was officially announced on the Distillery Row website this week that Integrity Spirits is no more. This was not truly a shock, as the Integrity Spirits site had gone dark months ago. In January or February, I saw smaller 375 cl bottles appear on the shelves of Portland liquor stores after the standard 750 cl bottles had disappeared, which I presumed meant they were selling off the last of their stock. Still, seeing the last nail driven into the coffin lent it a finality that was saddening. There aren’t that many absinthe distillers to begin with, and each one lost brings the drink closer to the brink of obscurity yet again. 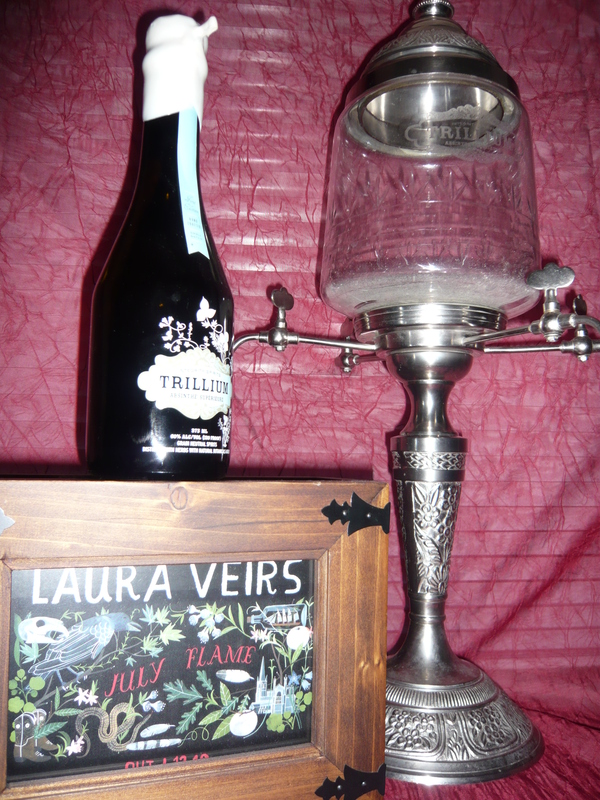 On a more personal note, Trillium was the first (and in fact, is still the only) absinthe I ever ordered out. While I tend to drink fine liquor at home (partly to be in a more intimate environment with friends, and partly because I don’t want to pay the exorbitant markups), and especially absinthe because it’s so rare to find a bar which stocks even one decent brand, in 2010 I was tipped off to the fact that Hobnob Grille, which was a mere two blocks away from my (then) apartment on Belmont St., stocked two absinthes. Ok, in point of fact they only stocked one, since the other was Le Tourment Vert, a faux-absinthe which was mercifully booed into retirement some time ago, but I was more than ready to try the Trillium. My girlfriend and I walked in and sat down, noting the unique environment of what amounted to a sort of sports bar which nevertheless had only one television and wrap-around bar on one side of the restaurant, and a wide-open space with a few tables and a ping-pong (table tennis) table in the center. We ordered some food (I believe some creole calimari, and definitely some french fries), and then we ordered our drinks, including the Trillium. The waiter asked me if I would like a glass of water to pour into the absinthe (a rare insight for wait staff in 2010 and maybe still today, from what I understand), and then he apologized that they didn’t have an absinthe spoon. To his amusement, I pulled my own out of my pocket. I was never in the Boy Scouts, but I had the “Be prepared” motto down cold. He brought our drinks, and I set about louching up the Trillium. I was happy, my girlfriend was happy for me, and it was a nice feeling to simply be able to enjoy a glass of absinthe at the green hour out in the wild as if it was a mundane, everyday occurrence. The waiter offered to bring us paddles and a ping-pong ball in case we wanted to have a game, but we played it cool and just soaked in the eccentric atmosphere. It was a moment. Incidentally, while local Portland favorite (and fantastic singer-songwriter regardless of geographical location) Laura Viers wasn’t playing on the sound system, her hauntingly beautiful songs were reverberating in our ears from her albums (and her in-store performance in the Apple store). If you’d like a taste of the July Flame album from 2010, I recommend “Life is Good Blues”, although “Galaxies” might be my favorite song of hers. Ah Portland, all of your quirky coolness is missed. In addition to Trillium absinthe, Integrity Spirits also produced a few other spirits, the most notable of which may be 12 Bridges Gin. I’m not sure of what other promotional items they may have had made up for the distillery, but below you will find an extremely rare Trillium-branded absinthe fountain. Mind you, I have no numerical evidence on which to base that notion, but I triple-dog dare you to try to find another one. If you do, we should share a drink. Of all the various accessories associated with liquor and cocktails, arguably none of them are as unique and specific in use as the absinthe spoon. These little trowels of tastiness are essentially spoons with holes poked in them, and the apparent perversion of such an austerely utilitarian tool as the common spoon was undoubtedly pointed out by more than one of absinthe’s detractors before the Great War as the sign of a damnable and devilish product. ‘Babylon has fallen!’ proclaims the sweaty revivalist/prohibitionist, dramatically attempting to quench his thirst with water from a nearby well, yet painfully unable to do so because the water falls through the holes before he’s even able to bring the spoon to his lips. One can almost hear the weeping and the gnashing of teeth. Or perhaps it never came to that. Based on noted historian Benoît Noël’s research of hundreds of documents of the period (which hey, I would have been happy to do myself, except that I don’t speak French), it seems that the iconic absinthe spoon did not make it’s debut until approximately 1889, nearly 100 years after distilled absinthe as a beverage made it’s debut (and at least 20 years after the anti-absinthe contingent mobilized). Prior to that, absinthe seems to have been served most often without sugar, a concept which makes sense given that almost no other liquor has sugar added to it. Presumably, the idea of adding sugar came into play as a method of minimizing the bitter wormwood taste and making the drink more palatable to those used to Swiss blanches (which are naturally sweeter), as well as to women, who were increasingly becoming more independent and empowered during the latter half of the 19th century. The Swiss seem themselves to have introduced the absinthe grille a few years before the absinthe spoon, and an absinthe grille functions in much the same way: it is placed over a glass containing a dose of absinthe, and sugar cubes are rested on its perforated surface, ultimately to be dissolved into the drink by dripping water onto them from a carafe or fountain. However, grilles do not have a handle, and they are also too wide to fit inside of most glasses, so a standard spoon had to be used to mix the sugar granules into the finished drink. At some point, it would seem that some anonymous soul had the brilliant idea of combining the two implements into one magnificently elegant tool; and yet, as loathe as I am to admit it, it may be that we owe the invention (or at least the popularization) of the absinthe spoon to marketing. The year 1889 isn’t an arbitrary one to use as the date of the earliest known absinthe spoon (as well as the earliest-known illustration featuring an absinthe spoon – see below for that). As much of an icon as the absinthe spoon became, the most iconic piece of metal associated with France is unquestionably the Eiffel Tower. This architectural masterpiece was completed in 1889 as the entrance to the 1889 World’s Fair, and as impressive as it is today, it must have been a jaw-droppingly marvel to the average fair-goer in the late 19th century. A plethora of memorabilia associated with the Eiffel Tower was soon to follow, and one of the first was a commemorative absinthe spoon. This detailed and somewhat baroque spoon has since become one of the most highly sought-after collectibles in the absinthe world. After the idea of sugaring absinthe via a perforated spoon came into fashion, a wide variety of spoons entered the marketplace, although most of the types typically used in cafes and bistros throughout France tended to be fairly simple. That being said, in the satirical illustration of General Boulanger done by Sem (Georges Goursat) below, you can just barely make out a long, curved tip on the spoon, a feature found on a type of absinthe spoon called “Losange étirée,” or “elongated Diamonds”). This elongated type of spoon is quite a bit rarer than those without the curved tip, and appears to have been intended as a way to rest the tip of the spoon on the edge of a bistro saucer so that the spoon did not come into contact with the table and remained sanitary (or at least, that’s the conclusion S—- and I came to after examining one — I haven’t yet been able to confirm that through any historical reference). I’ll go into much greater detail about absinthe spoons at a later time. In the meantime, enjoy the comical art and feel free to come up with your own slant on what it means. To date, there hasn’t been any definitive interpretation of the humor here. General Boulanger did have a large base of support around 1889 and had a window of opportunity to gain great power in France, then inexplicably fled to England, after which his backers turned away in disappointment, he was pronounced a traitor by the French Senate, and a couple of years later he came back across the English channel to Belgium, where he killed himself at the graveside of his mistress who had died the year before. Ironically, while he seems to have been a user of opiates, General Boulanger does not seem to have been much of an absinthe drinker at all, and so the absinthe glass and spoon are likely symbolic of French decadence, excess, or something else entirely. If you think you might know, by all means, please comment! Satirical illustration of General Boulanger, by Georges Goursat (aka, "Sem"), 1889. Suisse – This term may denote a grade of absinthe (the absolute highest) and/or a style of absinthe, produced by the “suisse” method and usually uncolored (i.e., a blanche). In modern times, it is mostly used synonomously with “blanche,” and there is not specific recipe aside from the “holy trinity” herbs used in absinthe distillation prior to the coloration step: grand wormwood, anise, and fennel. Pontarlier – Considered to be the definitive style of absinthe, the Pontarlier-style is also the most streamlined recipe, consisting only of six botanicals: grand wormwood, anise, fennel, petite wormwood, hyssop and melissa (lemon balm). A rural town in the farthest reaches of eastern France near the Swiss border. This small community became the nexus of absinthe production beginning with the 1805 opening of Pernod’s distillery, and lasting through the French ban on absinthe effective in 1915. Pernod Fils absinthe is the quintessential example of the Pontarlier style. Modern examples include Jade PF 1901 (which was reverse-engineered to be a clone of preban Pernod Fils circa 1901), and Walton Waters. Besançon – This style of absinthe contains the same six herbs of Pontarlier-style (grand wormwood, anise, fennel, petite wormwood, hyssop and melissa), but with the addition of coriander and veronica. The city of its origin and after which it is name is also in the eastern-most part of France, just northwest of Pontarlier. I am not aware of any modern absinthes which have attempted to replicate this style. Fougerolles – While containing the same six herbs of Pontarlier-style (grand wormwood, anise, fennel, petite wormwood, hyssop and melissa), with veronica being the only additional herb in the recipe, this style is best-known for having used the least amount of wormwood. The city in which this style originated and is named after is in the northeast of France, located north of Pontarlier and relatively close to Besançon. I am not aware of a modern absinthe made in this style; ironically, Verte de Fougerolles (now known as Enigma Verte) is reported to be noticeably wormwood-forward, which I suppose may have been what prompted the name change. Lyon – A style of absinthe containing the same six herbs of Pontarlier-style (grand wormwood, anise, fennel, petite wormwood, hyssop and melissa), with the addition of angelica and veronica. Lyon is located in the mid-east area of France, southwest of Pontarlier. One historical brand made in this style was Absinthe Suisse Grande Distillerie Lyonnaise. To my knowledge, there are no modern absinthes which have attempted to duplicate this style. Nimes – In addition to the six herbs of Pontarlier-style (grand wormwood, anise, fennel, petite wormwood, hyssop and melissa), the Nimes-style adds elecampane, veronica and mint. A city of southern France, located far south of Pontarlier and just northeast of Montpellier. Modern examples include: Belle Amie and “Tex Wreck” (a homemade or HG absinthe which is not commercially available). It is possible that the forthcoming Blues Cat absinthe from Delaware Phoenix will be a take on this style. Montpellier – A style of absinthe, containing the same six herbs of Pontarlier-style (grand wormwood, anise, fennel, petite wormwood, hyssop and melissa), with the addition of coriander and angelica. This style’s name is taken from the city of the same name, located in the south of France near the Mediterranean coast. The only modern example distilled in this particular style is Pacifique. Absenta (or Spanish) – This style of absinthe is a relatively latecomer, with absinthe production in Spain having first become established in the early 20th century. Spanish absinthe is known for having hints of citrus and for being slightly sweeter than typical French absinthes; the sweetness is due in large part to the anise which is sourced from the Alicante region in the southernmost part of Spain, although the typically lower ABV of absentas also contributes to it’s light airiness. While there is no truly definitive list of ingredients common to all absentas, the six ingredients of the Pontarlier-style (grand wormwood, anise, fennel, petite wormwood, hyssop and melissa) are commonly used with the addition of some star anise, angelica, and a little bit of coriander. Historical brands made in this style include Absenta Argenti, as well as the Pernod Fils Tarragona from the 1940s through 1960s. A modern example of a good absenta is Obsello. But wherein lies the devil in these details, you may wonder. 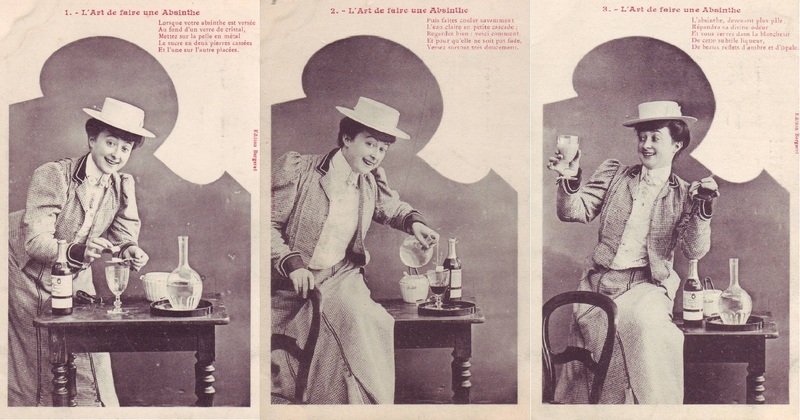 The marketing of absinthe in the 19th and early 20th century depended partly on quality grades, the lowest of which no longer exist (fortunately). 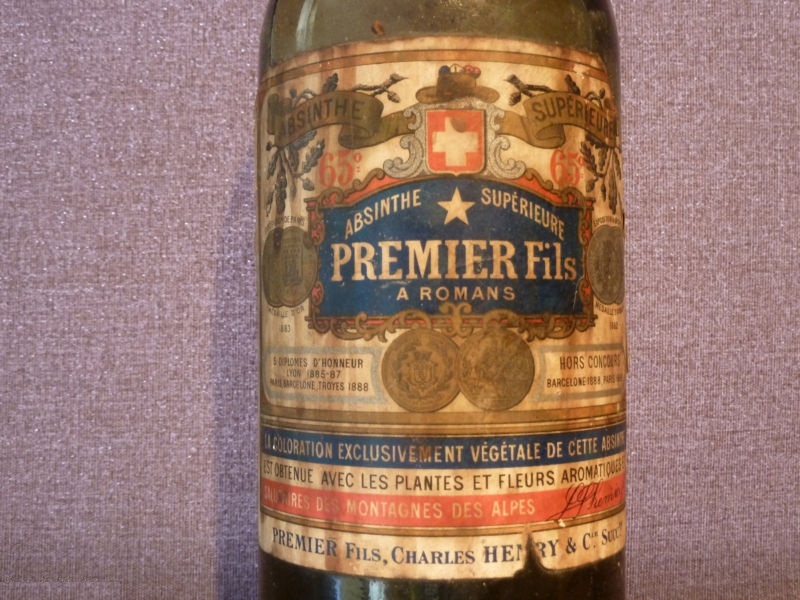 In short, while “absinthe suisse” was the nomenclature for a liquor of the highest quality, it was almost always used exclusively for blanches, while absinthe supérieure usually denoted the highest-quality vertes. After this came less expensive absinthes, starting with ‘absinthe fine’ as a sort of mid-shelf selection, before dropping downward to absinthe demi-fine (“half-fine”) which had a wide-ranging ABV of anywhere between about 40% to 53%, and finally ‘absinthe ordinaire,’ which generally had a higher ABV of around 46%, but was colored artificially with “indigo blue”. It was within these lower-shelf categories that the requisite cutting of corners would sometimes take a toxic turn. The coloration step of absinthe production is one of the most expensive because of the cost of high-quality herbs and other botanicals. To some folks’ minds (both then and even now), it also seems like one of the most superfluous steps, even though it isn’t just the color which is added during this stage, but also a final tweaking of the flavor. Regardless, those distillers who were looking to save money knew that they had to replicate a proper, peridot-green color in order to sell their product. As such, they decided to take short-cuts during this final step of production by using additives which ranged from the harmless (if not exactly flavor-enhancing) inclusion of herbs such as spinach or parsley (largely to help produce a cloudy louche effect), to the Oh-My-God-That-Is-Poisonous! addition of copper sulfate or antimony trichloride. While medical science had not yet advanced far enough for them to know it at the time, chemicals such as these can cause cardiac dysrhythmia (a.k.a., arrhythmia). I suspect that if there is any truth to preban absinthe having produced hallucinations during the Belle Epoque, it is very likely due to some poor soul having ingested one of these low-grade, poisonous absinthes. So remember this little mantra, my friends: If it’s absinthe ordinaire, you don’t want to be there! 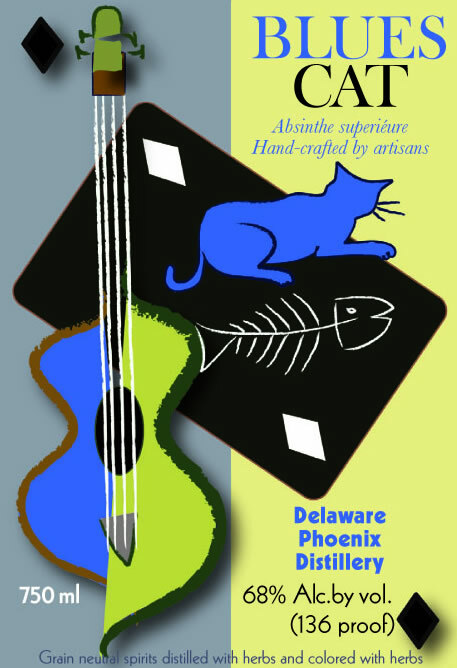 Delaware Phoenix update – the Blues Cat is out of the bag! The third Delaware Phoenix absinthe which last month I hinted at being in development has just had its label approved this week by the TTB. Congratulations to Cheryl Lins (the Master Distiller) and to the other three folks involved with the project. I can hardly wait to buy a bottle of this one! DP’s Walton Waters absinthe is still my favorite absinthe, with Meadow of Love not far behind, so it will be interesting to see how the new Blues Cat will rank among them. There’s no word yet about which ingredients were used in this one, but hopefully fish bones on the front label aren’t any indication! In all seriousness though, note how DP specifies that their absinthe is “distilled with herbs and colored with herbs,” and don’t settle for anything less with your own absinthe. Unless you’re on a budget and can happen to find a good oil-mix absinthe (in which case, please let me know what it is, because boy are those difficult to find). I’m a relative newcomer to the world of absinthe compared to many enthusiasts, I’ve been fortunate to have been able to try one sample of preban absinthe in my three years of chasing the green fairy. That was a life-changing event bordering on religious experience, but don’t tell Bill Mahr I said that or he might throw some of his hilariously clever (yet disturbingly mean-spirited and sometimes misogynistic) snarkiness my way. At some later date I’ll tell you the story about mine and S—–‘s dance with a 1905 (or thereabouts) glass of Edouard Pernod. In the meantime, I’m happy to report that, in celebration of S—-‘s completion of her Master’s thesis, an arduous project which my ladylove slaved away at for more than two years while working full-time, we indulged in a glass of 1910 (or thereabouts) Pernod Fils. Bear in mind that Pernod Fils was essentially the flagship absinthe of the Belle Epoque, or the gold-standard marque of the Gilded Age, if I may be permitted to mix geographically-specific terms, if not metaphors. It was the best-selling brand of absinthe in France, and by all accounts it was a high-quality liquor universally recognized as representing the finest of the distiller’s art, and best of what absinthe could be. Of those few folks who love absinthe enough to invest in a vial of the ever-dwindling supply of preban absinthe (a venture which should not be undertaken lightly, mind, as there are some unscrupulous folk who try to pass off newer absinthe as vintage preban), Pernod Fils is not only one of the more desirable marques to sample, but is fortunately also the most commonly encountered, by sheer virtue of how much was made and bottled in the last 20 years or so of absinthe production in France before the ban. We had been waiting for some time to try this particular sample, and this past weekend, after all the “t”s were crossed, the “i”s were dotted, and the stars finally aligned, we pushed the button on firing the final draft of S—-‘s thesis into the ether of the net on Friday, and set about celebrating on Saturday with this liquid time-machine. I’ll confess that my experience with the Edouard Pernod had set the bar almost impossibly high (is there a pun in there somewhere? ), and not surprisingly, the Pernod Fils did not make it over. What? You’re surprised? In fairness, I should point out now that despite all the overwhelming superlatives which rush out in almost every review of a preban absinthe (most of them justified, perhaps), it’s important to temper them with the knowledge that in most cases, we are not really drinking the same absinthe that our predecessors did 100 and more years ago. Even in those rare instances where the bottles have been well-kept in cool, dark environments for the past century, absinthe by its nature of being a botanically-based and infused liquor will age more noticeably, even in a sealed glass bottle, than will almost any other liquor or liqueur (with the exception of other botanically-based boozes, such as chartreuse). As such, the aged absinthe we are drinking might have gotten “better” over time in terms of taste (although this is still technically due to degradation); likewise, it may have gotten worse, or simply been altered in a way that is neither better nor worse. The Pernod Fils sample we had, as it exists now in 2012, was an excellent absinthe. In fact, I’d say it ranked in the top 5 of absinthes I’ve tried in terms of quality, and I’ve tried more than 30 in my three years of exploration. It had a lovely floral aroma in which the exceptional Pontarlier wormwood was prominent (although not extremely powerful), followed by the noticeable softness and fragrance of hyssop. It may be an overused adjective in the absinthe world, but the word ‘alpine’ came to mind with a focused clarity. Still, this absinthe had an almost feminine quality in terms of how subtle is was in many respects. That isn’t a criticism at all, as exceptional subtlety is something to be celebrated by anyone who can appreciate it. Nevertheless, I’ll confess that I was a comparatively disappointed since I had been expecting this absinthe to boast a powerful presence akin to the preban Edouard Pernod absinthe I had tried. That’s when I had to stop and consider how very well-preserved this sample of Pernod Fils was in comparison to the Edouard Pernod. The 30 milliliters of this very rare drink had a bit of a peachy-brown color to it (see a picture of the louched sample below in an antique “egg” glass), and while it may not have retained much of the peridot green color that it undoubtedly had at the time of its production in or around 1910, it was still fairly clear and bright with noticeable trails of essential oils, the scent of which wafted up from the glass. In contrast to this, the Edouard Pernod sample from two years ago was a dark brown, with a deep, smoky-sweet aroma. Of the two, it’s most likely that the Pernod Fils was the closer to its original state, based on contemporary descriptions of each absinthe from a century ago. Therefore, while I may have enjoyed the Edouard Pernod sample more, that was due in significant part to how 100 years of aging affected the original Edouard Pernod, so that it was questionable how representative my glass truly was. After our celebratory sampling was over and I took a little more time to reflect on the experience, I realized that tasting the subdued yet sublime Pernod Fils made me appreciate how close many absinthes of today have come to capturing the essence of those fine old absinthes of yesteryear. After over 100 years of refining the art of distilling absinthe in the 18th and early 19th century, folks in the early 20th century had the luxury of taking for granted the number of high-quality absinthes available to them. While many of the details of that knowledge were lost after various prohibitions on alcohol in general (and bans on absinthe specifically), distillers are slowly rediscovering the best ingredients and recipes for making wonderful absinthe. I’ll happily toast to their continued progress with a glass of the finest of modern absinthe, but I wouldn’t refuse another dose of the rare old stuff if you’re offering. Absinthe mythology is as dark, alluring, and angsty as a heroin chic lead singer of any ’90s band. Admittedly, I’m looking hard at you, Hope Sandoval (of Mazzy Star, lately of the Warm Inventions), but from the 1990s, I could also look farther back and into the 1890s. Oscar Wilde sang lead for a band of one as it were, and is a wonderfully iconic and ironic figure when it comes to “absinthe fiction,” considering that at least three well-known quotes regarding absinthe are attributed to him, despite the fact that some assert he barely ever indulged in the drink. This type of fanciful exaggeration of the power of absinthe undoubtedly served as a two-edged sword in terms of the future of the drink, as it both inspired some souls to sample it for the first time with the hopes of gaining some sort of artistic enlightenment, while it simultaneously fueled the fires of the abstinence contingent who zeroed in on absinthe as the primary cause for the decline of Western (European) civilization, even as other alcohols were ignored. In truth, the concept of alcoholism as an disease which could accurately be diagnosed had not yet gained a foothold, and the “drys” actually gave the thumbs up to anyone and everyone drinking as much wine as they wanted, so long as they gave up hard liquor and spirits made from “industrial” alcohol. Ah, those heady days of yesteryear. Within this rather topsy-turvy environment, Oscar Wilde posited a famously rhetorical question about absinthe: “What difference is there between a glass of absinthe and a sunset?” A legion of conservative zealots with a complex agenda responded with force. And yet, as easy as it is to castigate these folks as being single and/or simple-minded for vilifying one alcohol over another, there’s no doubt that absinthe has a certain allure to it which other drinks do not. Perhaps it’s the almost hypnotic ritual of its preparation with the sugar and the spoon; or maybe it’s in how there is a mild but noticeable “awakening” effect after enjoying a glass, an effect which does not instill artistic talent in those who may lack it, but can provide a warm, healthy atmosphere in which creativity may bloom. 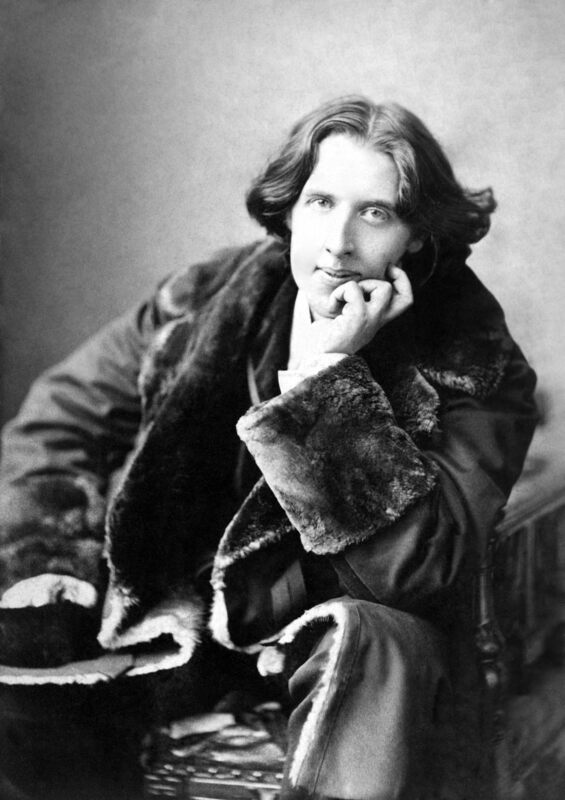 Today isn’t the anniversary of Oscar Wilde’s birth, or death, or any other date of note during the course of his lifetime. As such, it’s the perfect day to raise a toast to the chap, and so I do. This one’s for you, Oscar. In the mind of most Americans with a passing familiarity with absinthe, it is almost exclusively identified with the 19th century France. Some folks who have done a little research would spread the map out a little further and be able to link it with Switzerland (absinthe’s birthplace), as well as the surrounding countries in western Europe where it was also consumed, but they are often genuinely surprised to find out that absinthe was actually consumed here in the good ole’ U.S. of A (even if it wasn’t exactly flying off the saloon shelves). While you’d think that absinthe might have been popular in the “little Paris” of New Orleans (and you’d be correct), one of my favorite tidbits of absinthe history comes from the Pacific Northwest. I know, right? It’s hard to imagine the land of towering evergreens and the rough and tumble loggers who cut them down for a living as being particularly partial to a fancy-pants French aperitif, what with its flowery scent and sugared serving method, and yet there were apparently at least a few open-minded fellows (or perhaps simply some carpetbagger dandies from the Northeast who got lost on their way back from the Deep South after Reconstruction). No doubt there’d be a few Europeans who would be equally surprised to discover that absinthe was sampled by residents of a little town called Yakima. Now, I don’t know what Yakama means, but the town was named after the Yakama Indians, from whom the land was taken by men who could not properly spell. Suffice it to say that the battles came to an end soon enough, and an agriculturally-based township began to grow in the 1850s. It must have been a fairly successful one, because by 1890 they had some genuine, bona-fide absinthe stocked on the bar shelf (no mention is made of if it was American-made absinthe, which, believe it or not, did actually exist back in that proverbial day). 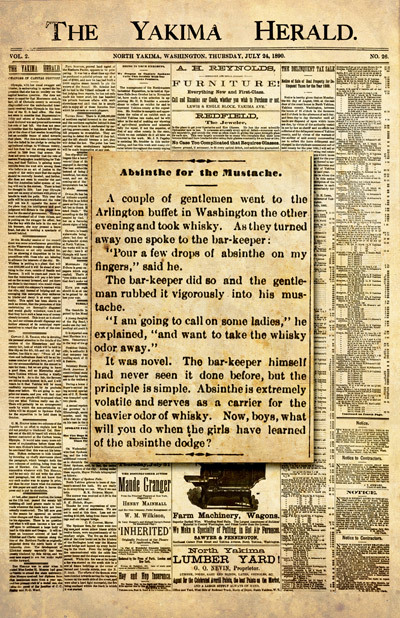 As you can see by the text of the article, though, it seems that the residents didn’t have much more of an accurate idea of what to do with absinthe than they did of how to spell proper nouns. Imagine how scrambled their brains would have been if they’d actually drank some of the stuff! Never let it be said that there are no imaginative swindlers running amok in the world. Of course, I’d love to be able to say that and have it be true, but then again, we’d have very little to talk about if everyone were good boys and girls. That being said, if you’re going to be such a cutting-edge crook that you’re going to fake an antique absinthe bottle and label combination, you really should learn how to read first. Otherwise, you’ll end up looking silly when the glass seal on the bottle reads “Pernod Fils,” while the label itself reads “Premier Fils.” Yes, yes, I know, there are only a few letters of difference there in the middle, but they do tend to be important. It probably won’t be shocking to anyone to discover that the bottle pictured below was being sold on eBay recently. Oh how I do miss the relatively innocent days of endearing “ghosts in a jar” and “Mother Mary on toast” auctions on the ole’ Bay. 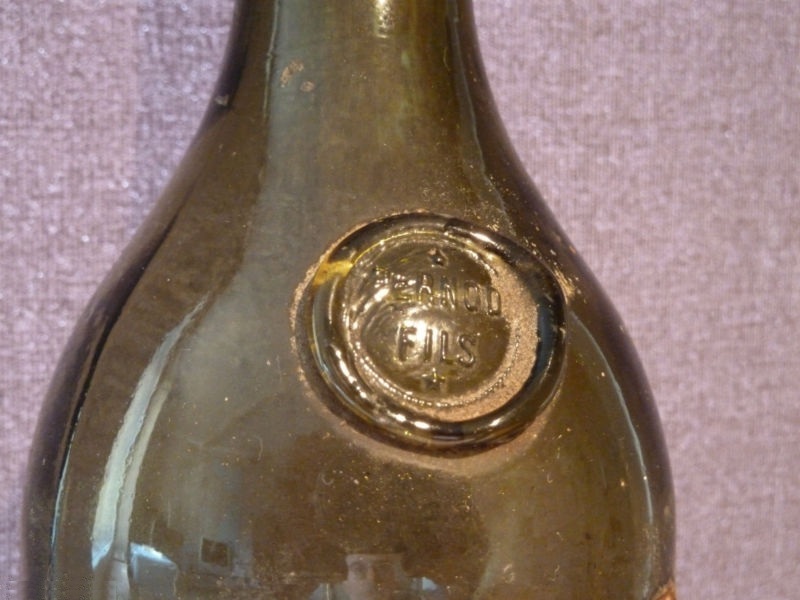 What’s particularly said is that the bottle itself does appear to be a genuine 19th/early 20th century Pernod Fils bottle, and the “Premier Fils” label likewise also appears genuine (although this is more difficult to tell based on pictures alone). Unused vintage labels can be found without too much difficulty, though, so it’s likely that some unscrupulous person bought one of those and artificially aged and distressed it so that it would appear to be a time-worn antiquity. Of course, it isn’t necessarily the seller who did this (hey, it could even be a 100-year-old fake or gag, which would actually be appealing if proven), but one does wonder how it escaped his attention, or why he didn’t mention it in the auction description if he did in fact notice it. In any case, it sold for 42 euros (about $65), which isn’t unreasonably high for an authentic Pernod Fils bottle without the label. Whether the buyer would have the heart to tear the presumably antique label off of it or not is something of a Sophie’s Choice, and I’m surely glad that my name isn’t Sophie. But don’t call me Shirley, either.